While other autonomous cars continue to grapple with things like trying to figure out where lanes are on poorly painted roads, Ford’s self-driving project managed to develop a vehicle that doesn’t even need to see ahead. Ford didn’t let it, either—they shut off the headlights and let the car loose in total darkness. In finding exactly where it is on the road, the Ford uses its 3D mapping system to be able to know the road and surroundings—the road markings, geography, topography and other landmarks such as signs, buildings and trees. The maps work in conjunction with a LiDAR system of lasers, which scan the area around the car with 2.8 million laser pulses per second and help it to position itself. As anyone would guess, the technology has to be tested on a closed course for now since vehicles need headlights on public roads. That begs the question of why an autonomous car would need the capability to navigate darkness in the first place, but this is just an extreme situation—since the car doesn’t need to rely on cameras like many other autonomous vehicles, it could be more useful in times of lower visibility—rain, snow and faint road markings, to name a few. 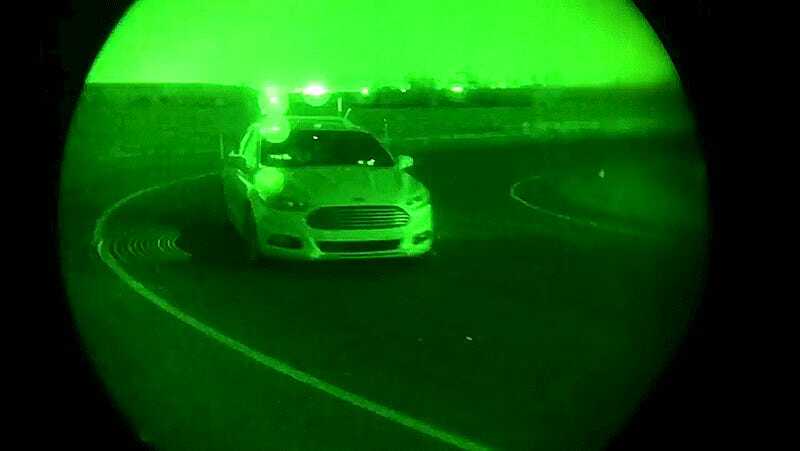 This project is a further branch of Ford’s extensive autonomous-car testing, which even includes its own fake city for driverless operations. The company will triple its fleet of self-driving cars this year, upping the count of Fusion Hybrids to 30 for testing on the roads of California, Arizona and Michigan. With triple the cars, perhaps we’ll see more fun tests like this one.